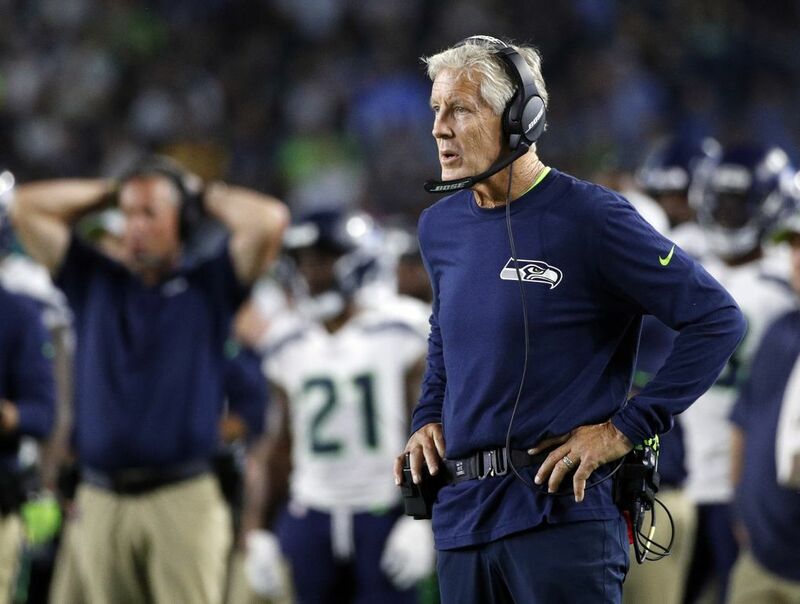 What went wrong on the right side of the Seahawks' offensive line? 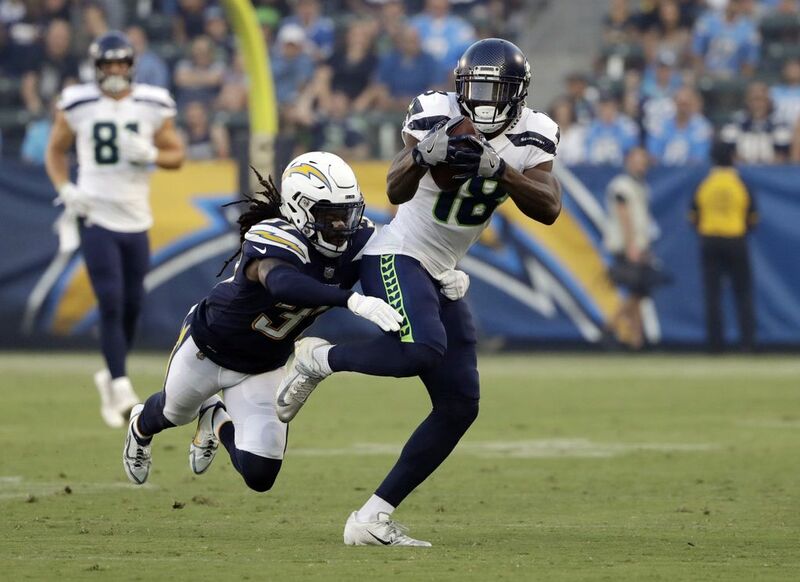 Here's what beat writer Mike Vorel saw in the Seahawks' second straight preseason defeat. The offense started hot. The defense started cold. 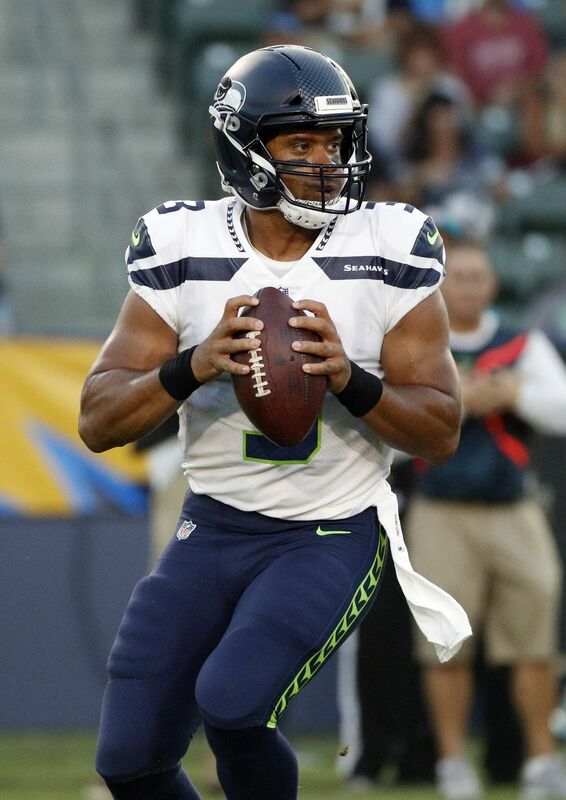 And the Seahawks started the preseason 0-2. 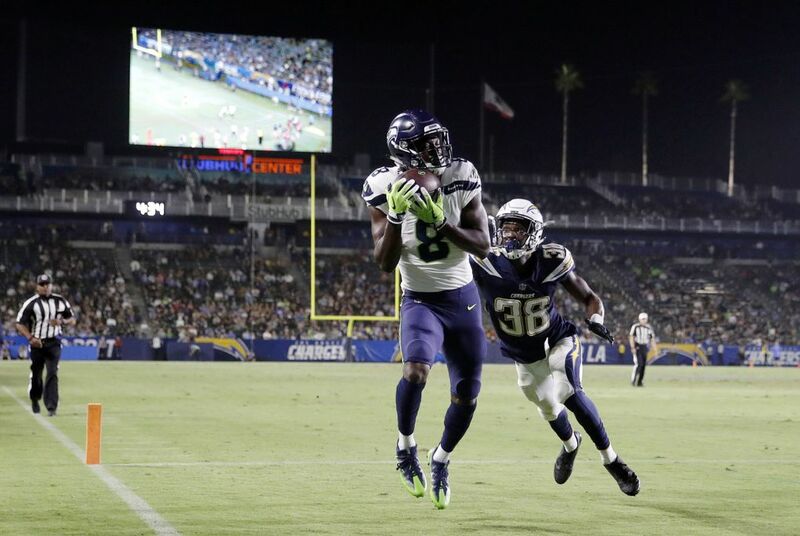 Here are three impressions from Seattle’s 24-14 defeat on Saturday night to the Los Angeles Chargers. Starting right guard D.J. 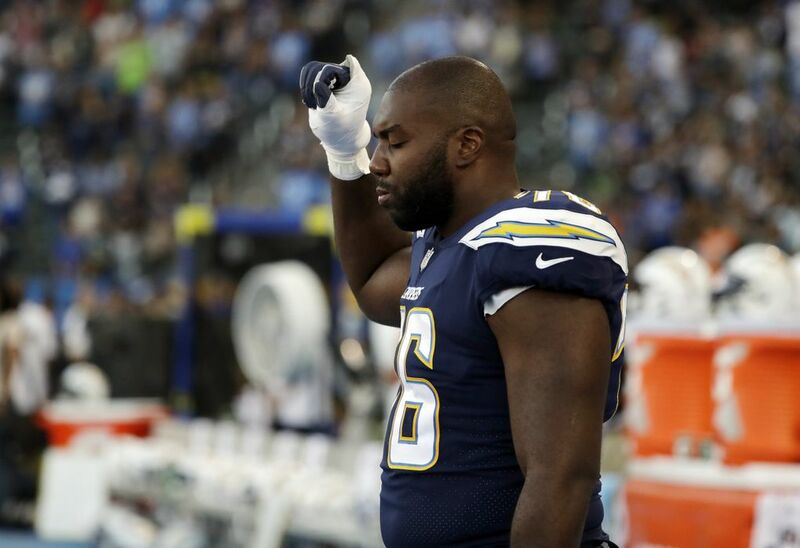 Fluker left in the first quarter of Saturday’s game with a finger injury. 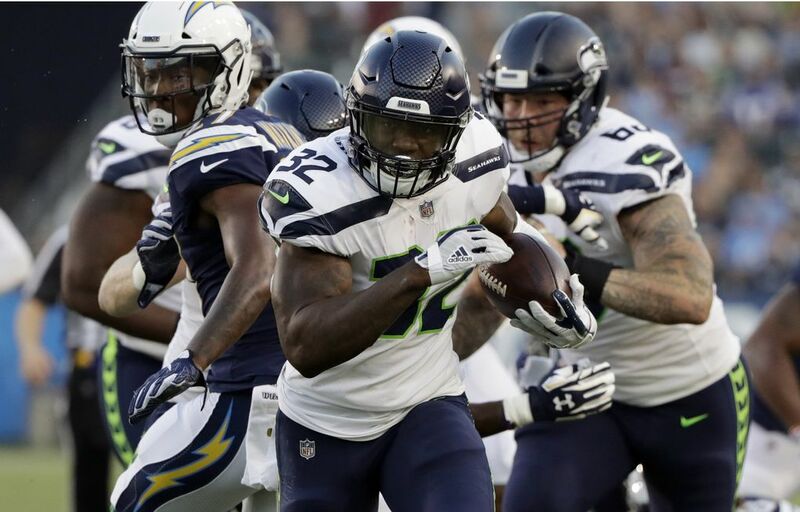 Fluker — a 6-foot-5, 342-pound first-year Seahawk — had been a mainstay on Seattle’s starting offensive line throughout training camp, participating in every practice after spending the 2017 season with the New York Giants. He was replaced by second-year pro Jordan Roos. 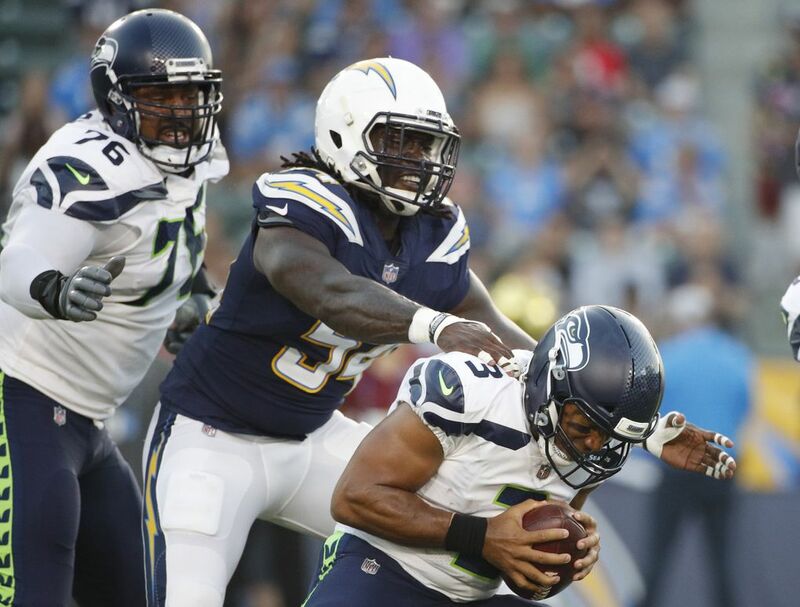 To Roos’ right, Germain Ifedi — a former first-round pick who started all 16 games at the right tackle position last season — struggled mightily with Chargers defensive end Melvin Ingram III, surrendering a sack and a handful of hurries. 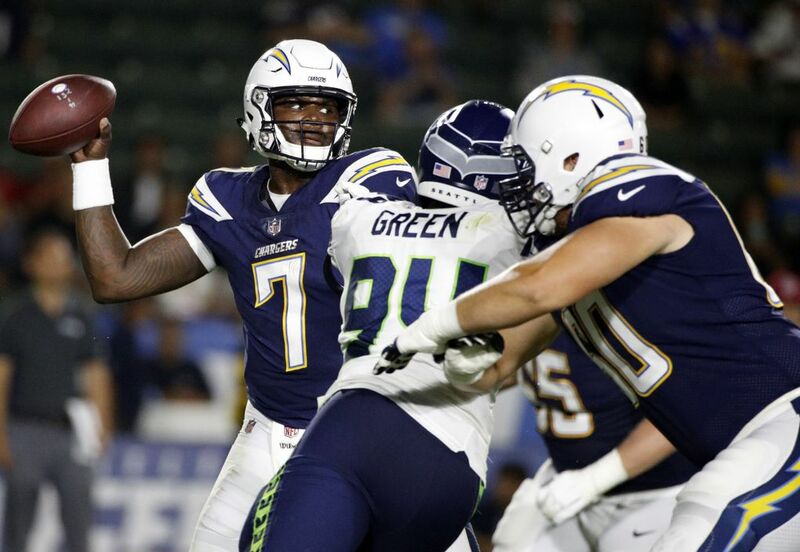 This comes on the tail end of an erratic training camp for Ifedi, who was benched during a mock game was inconsistent in last week’s preseason opener against Indianapolis. 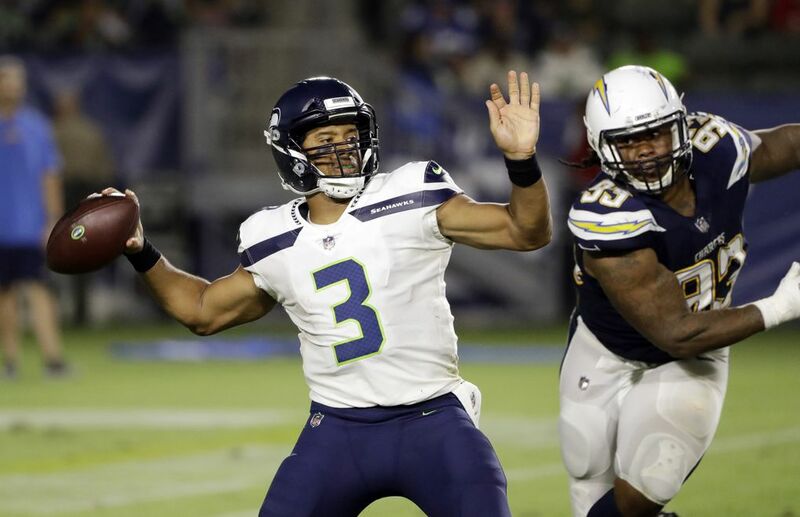 After notching field goals in each of their first two drives on Saturday, the Seahawks’ starting offense gained little momentum throughout the rest of the half. 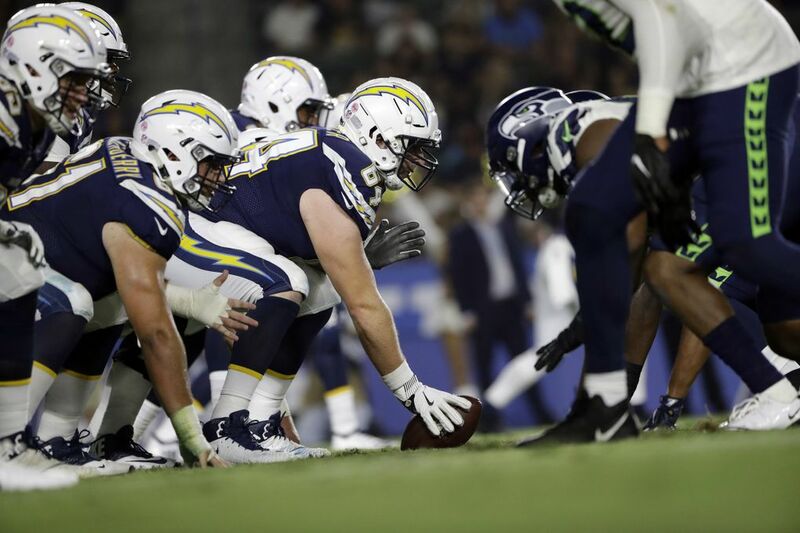 Together, Ifedi and Roos were thoroughly impaled by Los Angeles’ pass-rushers … despite the fact that standout defensive end Joey Bosa didn’t play. If Fluker’s injury is serious, it’s possible that veteran J.R. Sweezy — who has been out with an ankle injury — could be the eventual answer at right guard. As for Ifedi, it may be time to try out a new first-team right tackle. 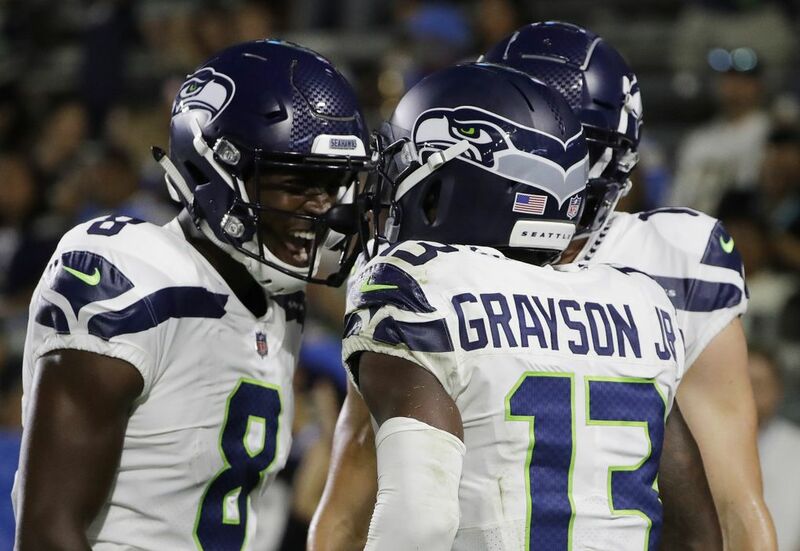 Three Seahawk wide receivers — Doug Baldwin, Tyler Lockett and Jaron Brown — are a virtual lock to make the team’s 53-man roster. 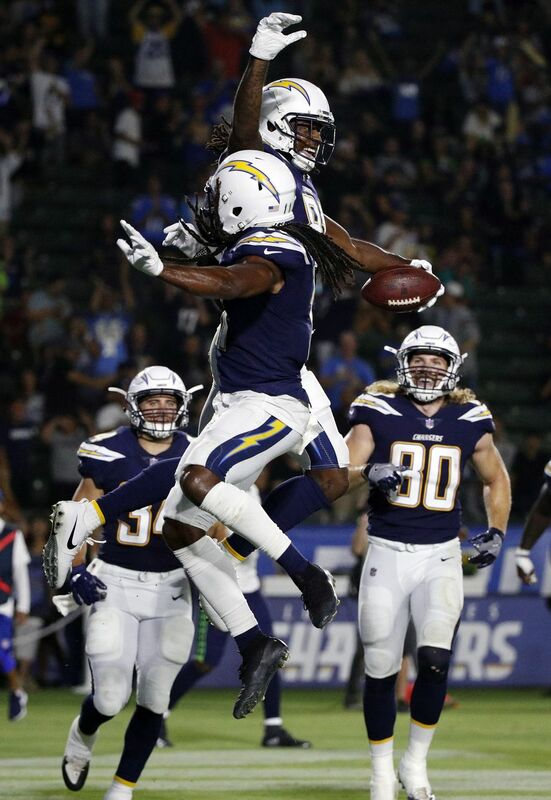 And, speaking of “up for grabs,” second-year wide receiver David Moore provided the highlight of the night on Saturday, leaping and corralling a Russell Wilson jump ball for a 52-yard gain between a pair of Charger defensive backs. On the next play, he added an impressive 19-yard grab along the sideline. 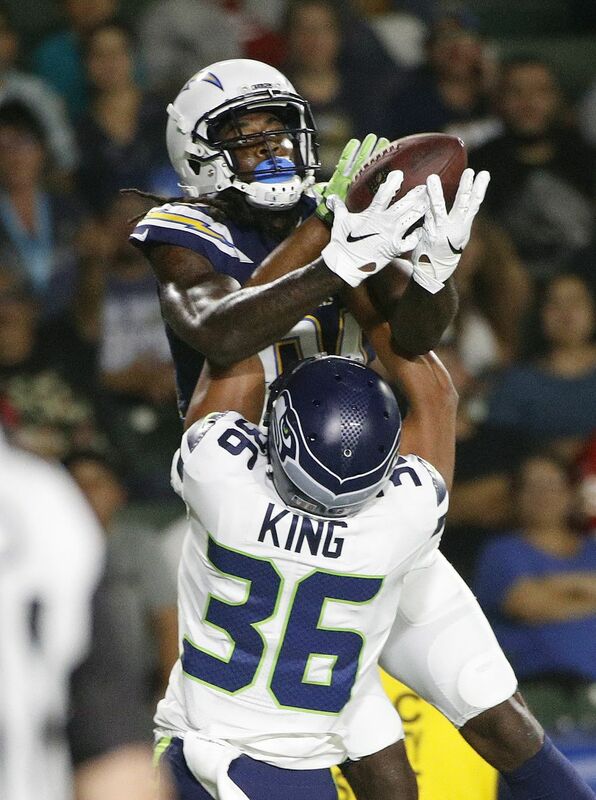 Moore, a 2017 seventh-round pick out of East Central (Ok.) University, is competing with the likes of Brandon Marshall, Amara Darboh, Marcus Johnson, Keenan Reynolds and Damore’ea Stringfellow for a spot on the Seahawks’ roster. In that regard, the 6-0, 215-pound target certainly helped himself on Saturday. 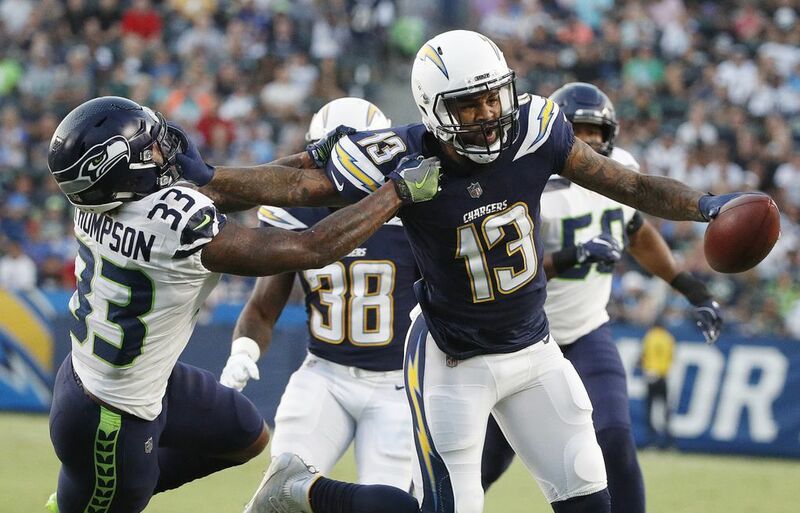 Besides Moore, Brown impressed with two catches for 74 yards in the team’s first two drives, further solidifying his place in the starting rotation. Baldwin (knee), Lockett (toe) and Darboh (hip flexor) all missed Saturday’s game with injuries. The good news is that Jon Ryan’s second quarter punt traveled 57 yards in the air. 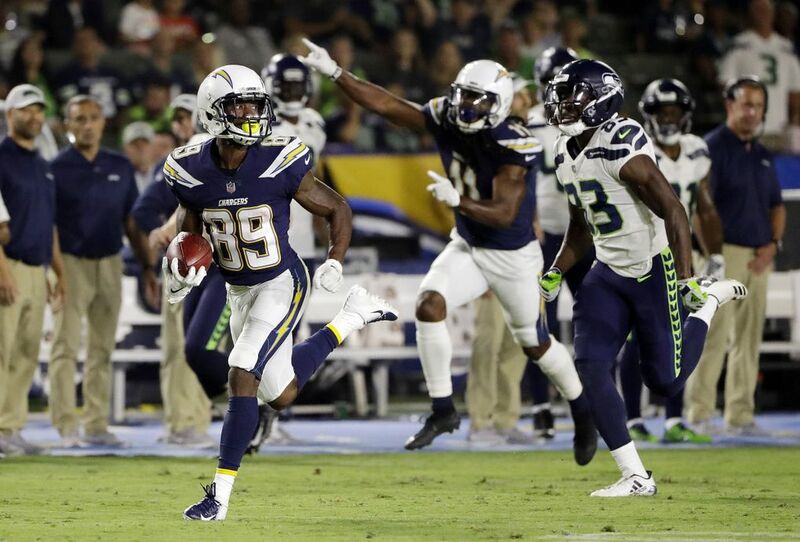 The bad news is that Chargers wide receiver J.J. Jones returned it 72 yards for a touchdown. A pair of Seattle defenders, defensive end Jacob Martin and safety Delano Hill, whiffed on Jones shortly after he caught the football. 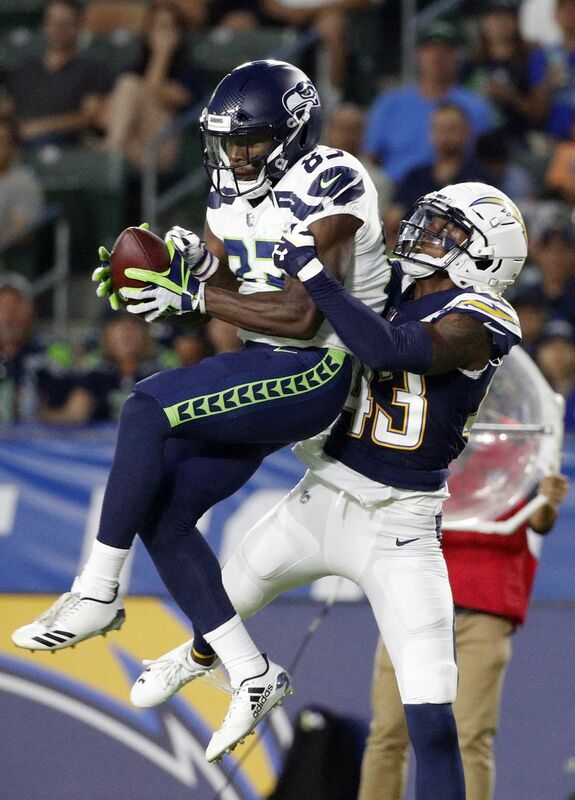 The 5-10, 173-pound receiver broke to his right, accelerated through a seam and outran Seahawk wide receiver David Moore into the end zone. 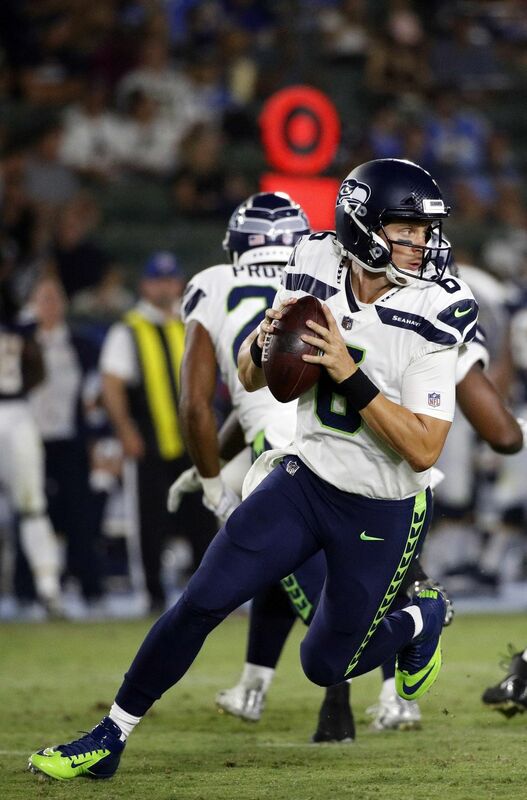 In the Seahawks’ ongoing punter competition, Ryan finished with two punts for an average of 44.5 yards and one boot inside the 20-yard line. 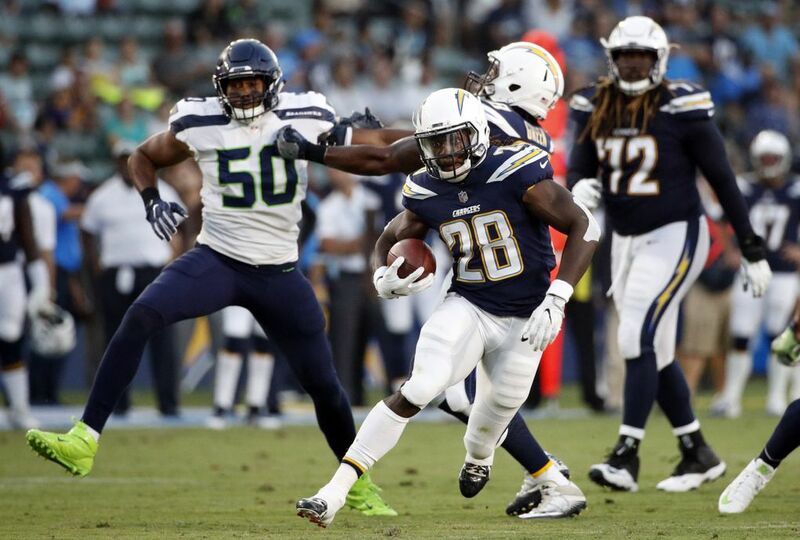 Rookie fifth-round pick Michael Dickson, the favorite to win the job, added three booming punts for an average of 53.7 yards and one inside the 20. As for the placekickers, both Sebastian Janikowski (25 yards) and Jason Myers (33 yards) connected on their only field goal tries on Saturday. The 40-year-old Janikowski remains the presumed starter in that role.